If you prefer to make your Christmas presents and love recycling household waste into useful things then this upcycled craft is for you. Its also quick and easy and ideal and ideal to make with children in the run up to Christmas. 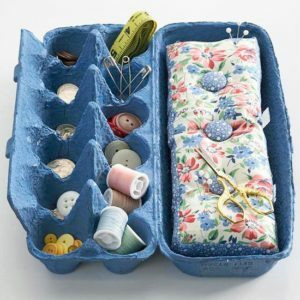 The beauty of this craft is that there are a number of gifts you can make with an egg box. We’ve turned ours into sewing kits and a hair band/hair clip tidy but you can also make jewellery boxes and stationery tidies and for children’s gifts you could fill with miniature toys, stickers or sweets and chocolates. For a new baby you could fill with tiny socks, mittens and facecloths etc. 2. Choose the material for the top of the egg box, measure and then glue to the lid. You can also make a pocket in the inside of the lid too for extra storage. 3. Last but not least find the contents to fill your box. 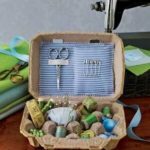 For sewing kits you could make a pin cushion or wrap cotton around pegs and for a stationery set you can source miniature staplers, sticky notes and scissors online.